If you have picked up a magazine in the past few months, you have certainly seen the words hyaluronic acid as the new “it” ingredient in facial care products. Like many others, I’m sure you asked yourself the burning questions: what is it exactly, why do I need it so badly, and in which products can I find it? Never fear, as always the Garden Gal is here to answer all of your questions! Recently, hyaluronic acid has become a popular ingredient in facial moisturizers and makeup. Unlike products that depend on moisture in the air, hyaluronic acid can help hydrate skin even in dry climates or heated rooms that rob skin of moisture. This is due to its ability to draw moisture from the air. It is said to hold up to 1,000 times its weight in water! Its unique properties form a barrier on your skin, giving a soft moisturizing effect that will make your skin smoother. This serum is Reviva’s highest-potency daily moisture booster. By compounding a higher level of premium hyaluronic acid into a lightweight fluid, this product can help raise skin’s moisture level to fill-in furrows, plump up tissues, and minimize lines. The most effective way to use this serum is to apply it under your night cream each evening. Or, if you’re like this Garden Gal with oily/combination skin, it can be used alone to gently hydrate skin. It has been especially light and refreshing in the recent heatwave, like a cool drink of water for my skin! This day cream is designed to protect your skin’s intercellular substance- where wrinkles and aging begins. It also fights free radicals and boosts skin moisture in any climate. Reviva’s patented InterCell formula actually works with the liquids you drink, allowing it to increase skin moisture and fight dry skin even in the driest of climates. The chemists of Reviva Labs developed this formula to strengthen the intercellular “gel” that surrounds the skin’s epidermal cells, creating a breakthrough in improving skin dryness and wrinkles.This unique gel combines the benefits of hyaluronic acid with natural cell-protective glycogen in order to help block free-radical damage from environmental pollution and sun exposure- a major cause of the visual signs of aging. Unlike other night products that simply add moisture to your skin, InterCell can add moisture even in the driest climates by working with the liquids you drink. For optimal results, Reviva recommends drinking 6-8 glasses of liquids a day when using this product. 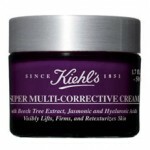 This amazing new facial cream from Kiehl’s is formulated as an advanced anti-aging moisturize that corrects the most visible signs of aging. Combining hyaruronic acid with the other key ingredients, Jasmonic Acid and Beech Tree Extract, this cream will lift, firm, and smooth your skin with clinically proven results in just two weeks. Not only will it work wonders on your face, but it’s also an excellent neck cream! Now that you know the secret to hyaluronic acid and the products that we carry, please visit us at the store in person or online. You can also call us at 651-293-1300 to place an order or ask us any questions about our products. Savor the last few days of summer with your deliciously hydrated skin!